Byaheng Victory is a collaboration between Victory Liner and Travel Factor. Are you interested in exploring Alaminos and Bolinao, Pangasinan? This is your chance to explore the famous Hundred Islands Park and visit some of Bolinao’s special tourist spots specially the Patar White Beach! 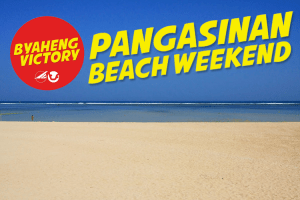 You can participate in Byaheng Victory’s Pangasinan Beach Weekend! This summer, they offer two schedules: March 23-24 and May 11-12. Reserve a slot now and enjoy a fun beach weekend!